In cooperation with public and private interests, The East Lyme Land Trust, Inc., protects and manages lands of significant natural resource, agricultural, cultural and open space value. Our members recognize the importance of East Lyme and Niantic as an area of great natural resources, scenic beauty, historical significance, and cultural heritage. We see a future where the beauty and ecosystems of the wild and working forests, the coastline and the region’s rich farming heritage are preserved forever. We lovingly care for open space with the help of a supportive community and see these efforts as a gift this generation makes to future generations. Work with landowners, resource agencies and other conservation organizations, to preserve open space. Perform conservation activities that will result in improved health of the vital watersheds and water resources and ecosystems of East Lyme and Niantic. Conduct conservation activities that will provide opportunities for people to directly experience the diverse landscapes of our area. Promoting scientific study and public education about natural resources such as plants, animals, birds and wildlife. Create and maintain easement monitoring programs, land management practices, and landowner partnerships that will be considered among the best in the State. Develop and sustain a robust financial reserve that ensures that we can continue to provide excellent stewardship of our lands in perpetuity and will be able to move quickly to acquire key parcels when opportunities arise. 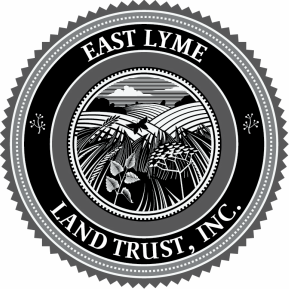 Incorporated in 1971, the East Lyme Land Trust, Inc. is a 501 (C) (3) organization as determined by the Internal Revenue Service and also is a qualified nonprofit organization as such terms is defined in Section 170(h)(3) of the Internal Revenue Code. Currently 857 acres are owned by the organization, all of which are open to appropriate public use. "As a sports fisherman and scout leader I have always been concerned with protecting the land and water supply system. I see being part of the East Lyme Land Trust as a means to be actively involved in the bigger picture of preserving our streams and lands for our grandchildren's use." "When my husband and I moved to East Lyme in 2011 we were awestruck by the natural beauty of the area. I'd like to contribute to the preservation of open space so that we live sustainably with nature. To not overcrowd or disregard watersheds, animal habitats and vegetation, but rather live respectfully and harmoniously as part of a healthy ecosystem that'll be here for the 'seventh generation.'"